Be the first to share your favorite memory, photo or story of Earl . This memorial page is dedicated for family, friends and future generations to celebrate the life of their loved one. 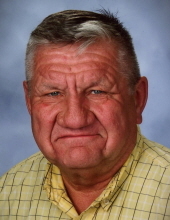 Earl Louis Marquardt, 69, of Mason City, died surrounded by his family at Hospice of North Iowa on February 2, 2019. A memorial service will be held at 10:30 am on Monday February 11, 2019, at Trinity Lutheran Church, 213 N Pennsylvania, in Mason City. A visitation will take place from 4:00 pm to 6:00 pm on Sunday February 10, 2019, at Major Erickson Funeral Home, 111 N Pennsylvania, in Mason City. Inurnment will be held at a later date in Elmwood-St. Joseph Cemetery. Memorials can be made out to the family of Earl L. Marquardt. Earl was born on May 11, 1949 in Blue Earth, Minnesota to Ray Chester Marquardt and Lucille Sophie (Ehrich) Marquardt. Earl grew up in a farming family and graduated from Truman High School in Truman, Minnesota in 1967. As a young man, Earl worked hard in a variety of delivery and truck driving roles including 7-Up, eggs, and farm equipment. He also worked as a supervisor for NIVC’s recycling center. In 1970, while living in Riceville, Earl met Jone Imelda McIntire while cruising the drag in Charles City. Earl and Jone wed on April 17, 1971, a union to which four boys were born. Later in life, Earl found his love for driving school bus. He truly enjoyed the children and the sense of purpose it gave him to serve the community in this way. Earl is survived by his loving companion, Jone Marquardt; sons Matt Marquardt, Troy (Michelle) Marquardt, Ryan (Heidi) Marquardt, and Aaron (Alisha) Marquardt; grandchildren Chris, Isaac, Aubrey, Jaxson, Brevyn, Daetyn, and Dylan; and brother Denny Marquardt. Earl was preceded in death by his parents, two sisters Joyce Taplin and Lois Cummings; and brother-in-law, Robert Taplin Sr.
To send flowers or a remembrance gift to the family of Earl Louis Marquardt, please visit our Tribute Store. "Email Address" would like to share the life celebration of Earl Louis Marquardt. Click on the "link" to go to share a favorite memory or leave a condolence message for the family.